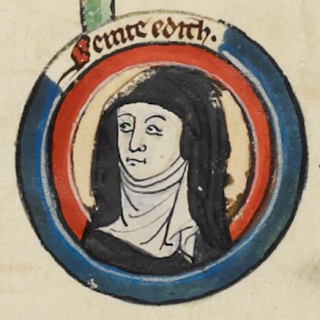 St Edith of Wilton, whose feast-day is 16 September, is a fascinating saint. She was a nun and a princess, but unlike many other Anglo-Saxon royal women who became nuns, abbesses, and saints, we know quite a lot about her personal qualities and interests. Usually we have to take the hagiographer's word for it that St Mildred or St Etheldreda was devout, merciful, charitable, and so on - or not take their word for it, as the case may be - but with Edith we have such detailed and precise information that it's possible to get a vivid picture of what this young royal nun was really like. Edith lived and died at Wilton Abbey in Wiltshire, and after her death in c.984, at the age of twenty-three, she was venerated as its chief saint - for reasons which, as we shall see, probably relate more to her royal birth than her personal qualities. She was the daughter of King Edgar (943-975), who in many medieval sources has a glowing reputation as a patron of the Benedictine Revival in English monasticism and a supporter of the church. However, his family situation was a little complicated, even for a tenth-century king. Edgar had sons by two different women, a precarious state of affairs which after his death resulted in supporters of the younger son (Æthelred) murdering the elder (Edward the Martyr), a crime which cast a long shadow over Æthelred's reign. Some later medieval historians saw the murder of Edward the Martyr as the beginning of the end of Anglo-Saxon England, a deed so terrible that it brought God's punishment upon the nation in the form of the Danish and Norman Conquests. They thought that Edgar's reign, which even at the time was seen as a Golden Age, had within it the seeds of its own destruction. St Edith was Edgar's child by a third woman, Wulfthryth, who at the time of Edith's birth was a young noblewoman being educated at Wilton Abbey. The nature of her relationship with the king was a matter of controversy, about which the early sources don't agree; some say the couple were lawfully (if briefly) married, others that Edgar abducted Wulfthryth from the schoolroom, others that he raped her. Whatever the truth, Wulfthryth gave birth to Edith at the royal manor at Kemsing, in Kent, and then returned to Wilton Abbey with the child. Young Edith was educated at Wilton and spent all her short life there, along with numerous other noblewomen who were brought up in the abbey. A prosperous nunnery in the heart of Wessex, Wilton was the place where the daughters of the royal family and the aristocracy were educated. Even among this exalted company, Edith's royal birth and connections gave her a special position, and it's not surprising that she made a memorable impression on the community. Within a few decades of her early death, she was being venerated as their patron saint, a cult promoted by her mother, by now abbess of Wilton. I mentioned Edith before when I wrote about Wilton Abbey and Narnia; there I was describing the work of the monk Goscelin, who wrote an account of Edith's life and miracles for the nuns of Wilton about a century after her death (c.1080). You can't really understand the reputation of St Edith without approaching her through the work of Goscelin, which is based on what he had learned from Wilton tradition - stories of Edith's life preserved through a century of oral transmission among the women at Wilton. 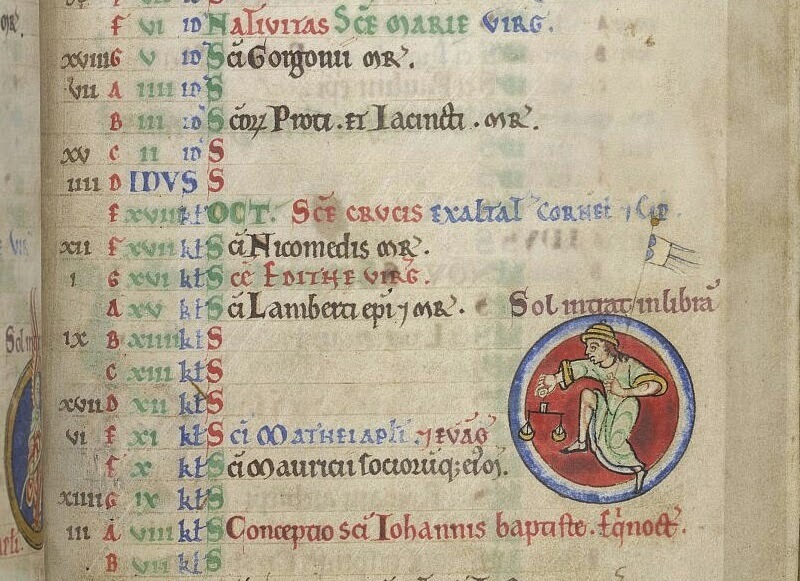 Goscelin, a Flemish monk who lived in England from c.1058 until his death in c.1107, was a first-rate hagiographer, and something of an expert in writing the lives of Anglo-Saxon saints (he worked on commission, and was very prolific: he wrote texts for the saints of Ely, Barking, Canterbury, Sherborne, Ramsey and perhaps more). For English monasteries seeking to commemorate and consolidate the records of their saints at the end of the eleventh century, Goscelin was the man for the job. But Wilton was especially close to his heart: he had been chaplain and tutor to the nuns there for something like fifteen years, and he wrote the life of Edith after he had been ousted from this happy home by the death of his patron. So he knew Wilton very well and had a strong affection for the place and its people, and in writing about Edith, he wanted to praise its saint and please the nuns who were his friends. But he could only use the material he'd been given to work with, and the things the nuns of Wilton knew about Edith were decidedly mixed from a hagiographical point of view. Edith was a wealthy young noblewoman of her time, and she behaved like one: she dressed in expensive and beautiful clothes, she insisted on having a heated bath-tub, she kept pet animals for her amusement (in a kind of private zoo, adjoined to the walls of the abbey, and consisting of wild and tame beasts which had been given to her as gifts), she got involved in the political intrigue which followed her father's death, and she argued with bishops who tried to advise her. Goscelin did his valiant best to put a good spin on all these things. Though not bad in themselves, they were not exactly in accord with the ideal picture of a nun, especially Goscelin's own idea of what a nun ought to be. Part of the interest in Goscelin's Life of Edith is seeing him try to negotiate this gap without falsifying his sources or exposing the saint to criticism. For instance, he assures his readers that although Edith wore splendid clothes, and not the modest black which women in a religious community ought to wear, it was with a hairshirt underneath: this contrast made her behaviour all the more admirable, he says, because "she made her humility more glorious by public elegance". He acknowledges that Bishop Æthelwold warned Edith about her ornate clothes - but also repeats her retort that God paid attention to her mind and not her outer garments. (Well, yes, Edith, but that doesn't usually stop nuns wearing habits!). One of the few miracles she performed during her lifetime involved her saving a chest of her clothes from fire - certainly a useful miracle, but not the most disinterested. With regard to the zoo, Goscelin admits that some of his readers might find this hard to swallow: "If any person, being too strict in justice, prefers to criticize rather than to praise such interest in animals as a product of her royal nature - utterly pointless, both for her to do, and for us to remember - let him consider whether this offence might not be counted more holy than his virtues, since exalted love and holiness of life excuses and indeed adorns every kind of conduct." If you say so, Goscelin. But some of Edith's other habits did not need to be explained away. She was a well-educated woman, with intellectual interests in all the ways usual for her time, and also in one less usual way: when she founded a church at Wilton dedicated to St Denis (to whom she had a particular devotion), she designed the paintings which would adorn the church. Her tutor executed the paintings according to her design, and Goscelin, who had seen the church himself, said of it "it is still so beautifully painted throughout the whole interior that it is more striking when seen than in any description". We know medieval churches were often painted, but the idea of a royal lady designing the decoration - and there doesn't seem any reason not to believe this - is an intriguing one. Edith's devotions were also remembered by the community at Wilton: Goscelin had seen her prayer-book (written, he says, in her own hand), with petitions she had copied out. They included "O Lord, father and ruler of my life, do not leave me in evil thoughts, do not give me pride of the eyes, and turn away evil desire from me, O Lord", and "Almighty and most merciful Lord, who brought forth for your thirsty people a spring of living water from the rock, bring forth from the hardness of my heart tears of contrition". Goscelin says the nuns of Wilton would still point out the places where Edith was accustomed to sit, to read, to pray; he says she used particularly to identify herself in prayer with Mary Magdalene, and I mentioned in this post her fondness for petitioning the apostles, the 'senators in the starry regions' who comprised heaven's House of Lords. In Goscelin's time Wilton preserved an alb embroidered by Edith with gold and pearls, in which she had depicted herself as a suppliant at the feet of Christ. The nuns remembered that Edith had been affectionately nicknamed 'Goda', which in Old English means 'good' but was also a real, and royal, personal name (it was also the name of her niece, Edward the Confessor's sister). These little details bring Edith alive, through the memories of the nuns of Wilton, and make Edith, fancy clothes and all, an attractive figure. After her death she was a popular saint with the English royal family, especially her half-brother Æthelred and her nephew Edward the Confessor. Cnut and his wife Emma also generously supported Wilton Abbey, an example followed by that proficient follower of royal fashion Earl Godwine, who had his daughter Edith, future queen of Edward the Confessor, educated at Wilton. Goscelin tells us that Cnut's fondness for Edith came about when he was caught up in a storm at sea and, about to be shipwrecked, prayed to St Edith and was saved. An alternative story - very definitely not told by Goscelin, who tiptoes around anything that might cast a slur on King Edgar - says that Cnut refused to believe Edith was a saint at first, because he questioned how she could be a saint when her father was such a lecherous brute. Cnut was at Wilton, expressing this opinion rather forcefully, when he said this, and he ordered Edith's tomb to be opened to test her sanctity. This was done, and as the king was looking into the tomb the dead girl rose up from her grave and attacked him, until he fainted and collapsed on the floor. When he came to, he was convinced of her sanctity - or too scared to doubt her again. Edith's posthumous miracles contain a surprising number of stories where her dead body comes to life and terrorises someone. Much like St Etheldreda at Ely, she could be astonishingly violent in defence of her abbey: one particularly memorable story tells how a nobleman named Agamund unlawfully seized some property belonging to Wilton, and died before he could be forced to give it back. But after his death, when his friends were keeping watch and mourning over the body, he suddenly came back to life with a terrible shout, and told them in terror that St Edith was refusing to allow him either to live or die while he occupied what was rightfully hers. He begged them to go to Queen Emma and get her to come to him, so he could return the property to her and thus to Wilton. The queen at first refused, because "she shrank from visiting a corpse that had been brought back to life" ("such is human weakness", adds Goscelin, which seems a little harsh - I'd shrink from it too! ), but at last she came, the property was officially returned, and the man was allowed to die without fear of St Edith. We shouldn't finish here without another word about Wilton Abbey; I wouldn't like to leave you with the impression that it was full of vengeful corpses. Anglo-Saxon nunneries were important centres of women's education which gave their inhabitants - both nuns and the laywomen who were educated there before going on to marry - access to opportunities for learning which wouldn't be available to most people for centuries. This is particularly true of Wilton Abbey; the fact that Goscelin was their chaplain and wrote Latin works for them, probably at the instigation of the nuns themselves, is a testament to their interest in history and their active participation in the production of literary texts. The young nun Eve, for whom he wrote his Liber Confortatorius, seems to have been an extraordinary woman, a serious scholar who found life at Wilton Abbey too easy, and voluntarily left her home and homeland in search of a more demanding rule; she left England and became an anchoress in an 8-foot cell in Angers, where she read and studied an impressive range of books. Although Eve apparently didn't find Wilton Abbey strict enough, that someone as serious as Goscelin was so much at home there is a compliment to the community she left behind; it was not only - as people sometimes call it - a 'finishing school' for Anglo-Saxon noblewomen. Along with Eve and St Edith, just about every noblewoman educated at Wilton has an interesting story deserving of its own post. St Margaret of Scotland probably acquired some of her not inconsiderable learning there, and may have had her daughter Matilda/Edith (future wife of Henry I) educated at Wilton too. 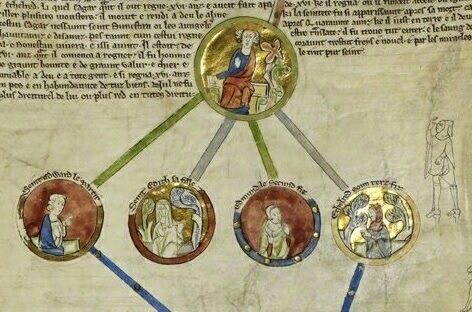 Queen Edith, sister of Harold Godwineson and wife of Edward the Confessor, was educated at Wilton, apparently rather well, and after the Conquest spent part of her time in retirement there. It may have been at Wilton that she arranged for the writing of the Vita Ædwardi Regis, her record of the history of her saintly husband and ill-fated brothers. Wilton seems to have provided something of a refuge for English women left in a perilous position after the Norman Conquest; the English abbess Godgifu was not replaced, as many English heads of religious houses were, and a number of women from supplanted aristocratic families found sanctuary at Wilton. Harold Godwineson's daughter Gunnhild, left fatherless by the Conquest, took shelter as a nun at Wilton and caused a scandal by running off from there with a Norman baron, Alan Rufus, and then living with his brother, despite not marrying either of them. Anselm wrote to her urging her to return to the convent, in letters you can read here and here. At one point he reminds her of the impermanence of earthly glory by recalling that even her father and mother, 'the King and Queen', were dead: "their exalted rank, their pleasures, their riches neither preserved them nor went with them". If I were the daughter of England's last Anglo-Saxon king, I think this would focus the mind. All quotations from Goscelin are from Writing the Wilton Women: Goscelin’s Legend of Edith and Liber confortatorius, ed. Stephanie Hollis, with W. R. Barnes, Rebecca Hayward, Kathleen Loncar, and Michael Wright (Brepols, 2004), an invaluable book. I wrote about Cnut, Goscelin, and St Edith in an article in The Medieval Chronicle 9 (2014). Thanks for commenting. I do recommend the 'Writing the Wilton Women' book, if you can get hold of it; it's full of information on Edith and the society she grew up in. I'm working on getting the "Wilton Women's" book. Our local public library is going to try to go out of system to find it for me. Amazon.com wants $103.45 for it, which the monastery bookkeeper is not going to spring for. So if the library doesn't come through, I have to go begging! On another note: There is a pathetic reproduction of Edith's personal seal on the internet. So far the British Library hasn't seen fit to respond to my queries about the possibility of a photograph or scan that would allow one to see anything resembling even an idealized portrait... One of our sisters is an iconographer. She has done an icon of St. Patrick of Ireland that we researched so he has the right tonsure, habit etc. i.e. doesn't look like a contemporary Greek monk. She would like to do a series of British saints, and I of course would like Edith to be one. Her seal would be a start for a prototype -- the illuminated portrait you have is darling, but if Edith never literally "took the veil," must be based on wishful thinking. The stained glass portrait goes to the opposite extreme... If you have any ideas, I will be grateful! This picture dates to the 1030s, so not that long after Edith's death, and the clothing of the woman opposite the king is probably an accurate representation of what a royal lady would have worn in St Edith's day. (The woman is Queen Emma, who was married to St Edith's brother). Since Edith is said to have dressed like a royal lady rather than a nun, this is probably what she would have worn, and as for colour, she's said to have dressed in gold and purple.